MADISON, WISCONSIN-BASED Chef Jonny Hunter has a passion for hand-crafted, local food. The charcuterie produced by his company Underground Meats has won three Good Food Awards. His meat-centered restaurant, Forequarter, was nominated as one of the best new restaurants of 2013by Bon Appétit, and he was nominated for “Best Chef: Midwest” Semifinals of 2017 by the James Beard Foundation. With all this success, it’s hard to believe that he can’t find enough cooks to staff his kitchen. Amid historically low unemployment in Wisconsin and around the country, it’s perhaps no surprise that finding kitchen help is a major challenge for restaurants. But widespread employment isn’t evenly distributed—many minority populations still face chronic unemployment. To address that unemployment crisis, and to build a more diverse workforce, Hunter reached out to people who were systematically under-employed. In 2014, he joined with two other like-minded individuals, Matt Feifarek of Slow Food Madison and Chandra Miller Fienen of Starting Block Madison, to form FoodWorks Madison. At the top of their agenda was to develop First Course, a job-training program tailored to produce cooks ready for a kitchen job in three weeks. Their first cohort graduated in May of 2017. “We really want to make it so that our student [can] apply for a job on a Tuesday and be useful on a busy Friday night shift,” Feifarek said. In addition to Madison, restaurants in Chicago, New York, San Francisco and other cities around the country are also struggling to fill their kitchens with cooks. The low wages and long hours the restaurant industry is known for make recruiting cooks difficult. Although some restaurants have increased wages and benefits, the need for cooks still outnumbers the supply. According to the Bureau of Labor Statistics, the demand for cooks is expected to steadily increase as new restaurants continue to open and people continue eating out. Although the overall demand for cooks in schools, hospitals and cafeterias is expected to grow by 6 percent from 2016 to 2026, the growth for restaurant cooks is expected to grow by 12 percent. That means the U.S. restaurant industry will need a total of 1,377,200 cooks in 2026 compared to 1,231,900 cooks employed in 2016. To fill this need, leaders in the food industry are taking a more active approach to staffing their kitchens. Instead of waiting for the cooks to come to them, they are recruiting people to complete low-cost or free training programs with a job opportunity as the end result. Culinary Training Programs Across the U.S.
Programs in Boston, Cincinnati, Maryland, and most recently Chicago are tapping into a long-ignored labor pool to fill the city’s kitchens. Cincinnati COOKS! is a free culinary training program that has graduated more than 1,400 formerly under- and unemployed people, including recovering addicts, veterans, and chronically unemployed adults. The curriculum, developed by the Freestone Food Bank, includes life skills training such as job interview techniques to help students succeed both in and out of the kitchen. War veteran and recovering addict Adam McKinney joined the program straight from rehab. “The leadership that is around here, and the way they go about doing things, keeps all of us motivated,” he said. Within a year of completing the program, 80 percent of the graduates find jobs in the food industry or start a continuing-education program such as Cincinnati State’s Culinary Management program. The Maryland Food Bank runs FoodWorks, a 12-week culinary training program for low-income individuals in conjunction with the Community College of Baltimore County. Students learn basic culinary techniques, professionalism, and food safety while they prepare meals for their hungry neighbors. And in October, celebrity chef and restaurateur Rick Bayless announced that he is launching a culinary training program for low-income students at a food-and-beverage incubator called The Hatchery on Chicago’s West Side. “I believe this program can help surmount two big challenges in the city—lack of cooks to fill our restaurants’ kitchens and a lack of both solid preparation and career opportunities for the youth of Chicago’s toughest neighborhoods,” Bayless said in a statement. At Bayless’ program, high school- and college-age students will pay a minimal fee to learn basic culinary skills from Chicago chefs and then head to internships at Chicago’s best restaurant groups. 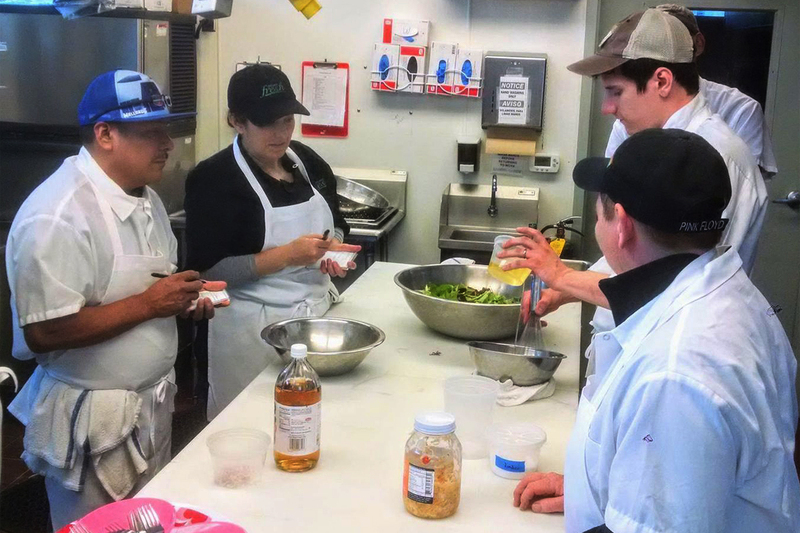 The FoodWorks Madison crew completed their first job-training program in 2017. 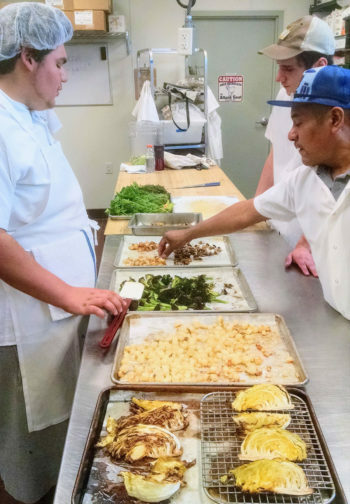 Feifarek describes First Course as “not a cooking school or a culinary school—this is a get-a-job school.” To develop the curriculum, FoodWorks worked with chefs and kitchen managers, community agencies, and an educator from the University of Wisconsin. In June, FoodWorks raised $56,500 through Kickstarter to develop the program further. The plan is to increase the training to 10 sessions a year with 20 students in each course. Once their program model is more finely tuned, FoodWorks will open-source First Course so other communities around the country can replicate and build on their success. That way, restaurants looking for cooks and workers looking for jobs will have more opportunities to find each other. “I love it when you can use one problem to solve another,” said Feifarek. All photos courtesy of Matt Feifarek. ACROSS THE Cuyahoga River from downtown Cleveland, men and women dressed in brightly colored clothing harvest vegetables from tidy rows of plantings. Multilingual conversations take place in Hindi, Nepali, Somali and English. With the Cleveland skyline as their backdrop, these refugee farmers nurture their connection to the land and to their new home. In 2010, the Cleveland nonprofit The Refugee Response created The Refugee Empowerment Agricultural Program (REAP) to support resettled refugees in the Cleveland area through farming. During the year-long program, men and women from Afghanistan, Nepal, Bhutan, Burundi, Myanmar, and Somalia learn language and job skills as they work the six-acre Ohio City Farm—one of the largest urban farms in the nation. This year, REAP expects to harvest 22,000 pounds of produce from the farm’s hoop houses and fields. The Refugee Response leases nearly five acres of the Ohio City Farm from the Cuyahoga Metropolitan Housing Authority. Since Donald Trump took office in January, the United States has become a less friendly place for people born in other countries. But various community groups across the U.S. have long supported refugees—often through efforts focused on agriculture. In addition to REAP in Cleveland, projects such as Plant It Forward in Houston, New Roots in San Diego, and the Refugee Urban Agriculture Initiative in Philadelphia have found that refugees and urban farming are a good fit, and despite the hostility at the federal level, they remain committed to their work. “We did a survey, and 80 percent of people who were coming as refugees have some sort of agricultural background,” said Refugee Response Director of Agricultural Empowerment Margaret Fitzpatrick. That makes a farm an ideal entry into the American work force. In addition, Fitzpatrick explained, people are coming from all kinds of backgrounds, often with a history of violence and trauma. Refugees find farm work comforting and therapeutic. REAP graduate Lar Doe has been working for REAP since 2012. Although he was born in Myanmar, Doe grew up in a refugee camp on the border of Myanmar and Thailand. After spending nearly 15 years there, he was granted permission to move to the U.S. in 2010. His first jobs were in Kentucky and Iowa, but then he accepted an invitation from the Refugee Response to relocate to Cleveland. He was one of REAP’s first refugee employees. Cleveland has a long history of welcoming refugees; since 1983, 17,000 displaced people have settled in the city. To better serve Cleveland’s increasing population of refugees, 16 organizations pooled their resources to form the Refugee Services Collaborative of Greater Cleveland in 2011. Collaborative members come from county refugee-resettlement agencies, area school systems, healthcare providers, and community and faith-based organizations. REAP’s current cohort includes 10 refugees from Congo, South Sudan, and Myanmar. As part of the program, trainees spend 28 hours each week on the farm and 12 hours in the classroom learning English as a Second Language. Farm work includes planting, seeding, harvesting, packing and delivery. For their farm and classroom time, they earn $9 an hour. “The farm provides a step into employment in an area where people are comfortable (farming) with a skill set that people already have (farming),” Fitzpatrick said. Graduates of the program have gone on to work in the food service industry or been hired to work for REAP itself. REAP also teaches participants about U.S. workplace culture. “The idea of being to work on time, calling a manager if you are sick, time sheet—those are things we take for granted being U.S. citizens, but these are skills that are not necessarily taught before they arrive,” Fitzpatrick said. Located on the west side of the city, next to public housing and across the street from the city’s oldest farmers’ market, the farm is ideally positioned to help integrate refugees into the diverse fabric of American life. “I’m very fortunate to have this job here, because this is an opportunity that I can get involved to the community and also learn more about the people and culture,” Doe said. Refugees have the opportunity to practice English with visitors touring the farm, with Americans volunteering on the farm, with REAP staff, with members of REAP’s 60-person CSA, and with customers at the weekly farm stand. The community aspect of the program also appeals to Lachuman Nopeney, a 52-year-old refugee from Bhutan who spent 20 years in a refugee camp in Nepal and came to the U.S. in 2009 with no work experience and few English skills. He worked at a restaurant in Milwaukee, where talking wasn’t encouraged. After going through REAP in 2016, however, he was hired by The Refugee Response to work on the farm. According to Fitzpatrick, Cleveland is a diverse city that celebrates different cultures. As a result, The Refugee Response has formed solid partnerships with area restaurants including Great Lakes Brewing Company, Urban Farmer, and The Flying Fig. In addition to buying produce, these and other local restaurants hold fundraising events, host dinners on the farm, and even employ REAP graduates. As one of the founders of the Ohio City Farm, the Great Lakes Brewing has a special interest in REAP and currently pays REAP to grow vegetables, herbs, and hops on the restaurant’s one-acre parcel of the Ohio City Farm. “We’re very fortunate to be surrounded by a lot of local food restaurants here in Cleveland,” Fitzpatrick said. NINETEEN-YEAR-OLD Hassan Amaleki is on the fast track to a successful career in the food industry. By the time he graduated from high school in 2015, Amaleki had worked for a thriving food business, completed an entrepreneurial training program, and led the launch of a successful new product. Amaleki gained these experiences through the Detroit Food Academy (DFA), an after-school training program for high school kids ages 13-20 that gives young people hands-on, real world experiences in developing, marketing, and selling artisan food products. Students work with mentor businesses, including Slow Jams, Friends of Detroit Potato Chips, Cynt-Sational Popcorn, and Brooklyn Street Local, to learn culinary and business skills. After completing the 25-week program, graduates earn a certificate in food entrepreneurship, and have access to a network of potential employers and an opportunity to enter a summer employment program. Best of all, the program is completely free. The unemployment rate among Detroit youth is alarmingly high at 30 percent compared to the city-wide unemployment rate of 6.5 percent. While the DFA has only just begun to track the activities of their 800 graduates, they do know that of the 44 students who completed the past two summer programs, 90 percent were hired by their mentors or the DFA. That’s 40 young people with new jobs. “That confidence our students are building is our main focus,” says DFA Executive Director Jen Rusciano. “Food is just the [most fun] way to do that.” Rusciano, along with Noam Kimelman and Amy Berkhoudt, founded the DFA at Detroit’s Cesar Chavez High School in 2011. The DFA offers their program at eight high schools around Detroit, and around 200 students have joined the DFA this year. DFA staff use portable equipment to turn classrooms into kitchens for cooking demos and workshops. The meetings themselves are often driven by student interest. For example Amaleki loves preparing pasta dishes. “We always cook and we always eat,” says Rusciano. At the beginning of the year, the students use a budget to plan field trips. DFA students have visited Detroit’s Eastern Market, one of the largest historic markets in the country; D-Town farm, an eight-acre urban farm run by the Detroit Black Community Food Security Network; and small businesses, such as Sister Pie on the city’s East Side. In the summer, the students work as interns with Detroit food companies, where they can pursue either a culinary or entrepreneurial path. “We try to walk the mentees through every aspect of running a business,” says Shannon Byrne, a DFA board member and the owner of Slow Jams in Detroit, where Amaleki worked. Byrne has been hosting DFA students since the program began. The students work with her on food production, selling at markets, sourcing ingredients, budgeting, inventory, and bookkeeping. Byrne sees the partnership as benefiting her business as well as the students. Students commit to one day a week with their food mentors. Amaleki learned to keep moving while at Slow Jams. “They taught me to get work done right away,” he says. Mitten Bites have taken off. They are for sale at 30 locations, including the Eastern Market and Whole Foods. Once a week, Small Batch Director Jacob Schoenknecht, Amaleki, VISTA service member Margo Dalal and DFA students produce Mitten Bites in a rented commercial kitchen. The team recently doubled their production level from two batches of 600 bites each to four.